1 A bad smell can clear a room. Research is actually being done by the U.S. Department of Defense to develop a stink bomb that will clear a rioting crowd. They are called "smelly repellents." Some animals can clear a room with little effort at all. 3 Skunks can use this weapon about six times before their supply runs out. 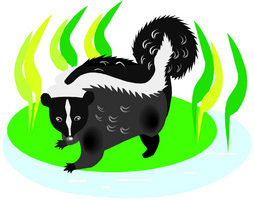 Skunks spray as a last resort. They will stomp their feet, raise their tails, and hiss before they spray. Once sprayed, this odor is not easily removed. The great horned owl is the skunk's most fearsome predator -- since the owl has no sense of smell.